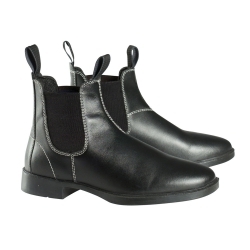 Comfortable jodhpur boots with elastic panels in the sides and off-white stitching. Leather with cambrelle lining. Sturdy sole and loops for removing the boots. Classic stylish jodhpur.